Just look at that color. The amber/orange of the Rogue Eugene City Brewery 200 Meter Ale is perfectly indicative of its viscous mouthfeel and resiny intensity. Brewed with Horizon, Amarillo, Centennial and Simcoe hops 200 Meter packs an impressive bouquet. But it’s also balanced out with Northwest Pale and Munich malts that don’t sweeten the brew, but instead tame the desert palate inducing hop bomb sitting just below the surface an provide a subtle toffee aftertaste. Founded in 2004, the Eugene City location is part of the Rogue Allied Brewery system. Previously the location of a toy store, a computer store, and eventually the West Brother’s BBQ restaurant, the Eugene City brewery is now the source of Rogue’s famous Track Town Ales series. 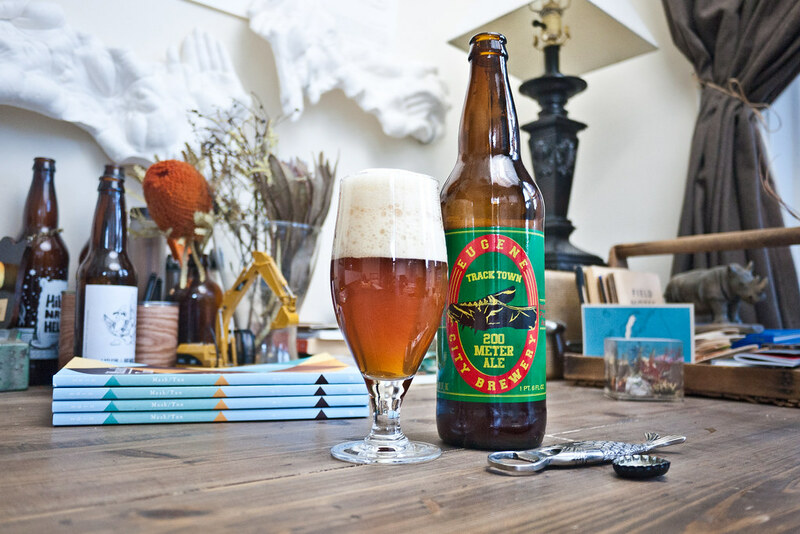 Nike’s early days in Eugene (now headquartered in Beaverton, OR) gave the city the nickname “Track Town” and these brews pay homage to Nike’s early days of handmade, experimental running shoes made by the legendary Bill Bowerman. Under brewmaster Nate Sampson, Eugene City operates a small, highly controllable seven barrel system devoted to artisan varietals. On my recent trip to Rogue’s Newport pub, I also picked up a bottle of Triple Jump Pale Ale from the Eugene City brewery. With a maltier backbone, this brew also had a rich copper color with a more modest hop profile. Both had a delicate balance amidst a burst of flavor that you can only get from a watchful brewmaster.